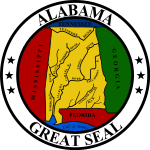 The 2016 United States presidential election in Alabama was held on November 8, 2016, as part of the 2016 General Election in which all 50 states plus The District of Columbia participated. Alabama voters chose electors to represent them in the Electoral College via a popular vote pitting the Republican Party's nominee, businessman Donald Trump, and running mate Indiana Governor Mike Pence against Democratic Party nominee, former Secretary of State Hillary Clinton and her running mate, Virginia Senator Tim Kaine. 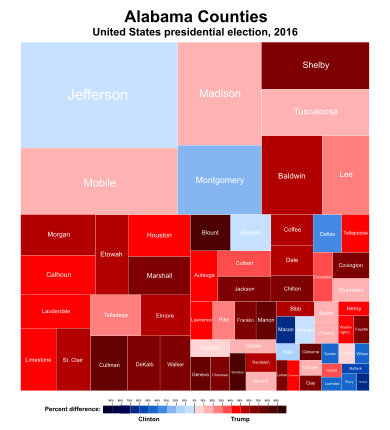 On March 1, 2016, in the presidential primaries, Alabama voters expressed their preferences for the Democratic, Republican, and Libertarian parties' respective nominees for president. Registered members of each party only voted in their party's primary, while voters who were unaffiliated chose any one primary in which to vote. Alabama has voted for the Republican candidate in every election since it was won by Ronald Reagan in 1980. Trump was heavily favored to win the state. Donald Trump won the election in Alabama with 62.1% of the vote. Hillary Clinton received 34.4% of the vote. The state gave 60.55% of its votes to Republican nominee Mitt Romney in 2012, meaning that it shifted about 1.5% more Republican from the previous election. The following are final 2016 predictions from various organizations for Alabama as of Election Day. Alabama had 9 electors in 2016 all of them voted for Donald Trump for president and Mike Pence for vice president. Results of the Democratic primary by county. ^ "Alabama Election Results 2016 – The New York Times". Retrieved November 10, 2016. ^ a b Merrill, John H. (November 29, 2016). "Official Canvas of Results" (PDF). AlabamaVotes.gov. Alabama Secretary of State. Retrieved February 16, 2017.